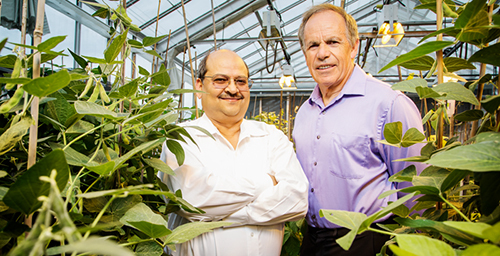 Professors Praveen Kumar, left, and Stephen P. Long have developed a computer modeling system to help plant scientists breed soybean crops that produce more and use less water. CHAMPAIGN, Ill. - Crops that produce more while using less water seem like a dream for a world with a burgeoning population and already strained food and water resources. This dream is coming closer to reality for University of Illinois at Urbana-Champaign researchers who have developed a new computer model that can help plant scientists breed better soybean crops. Darren Drewry, a former postdoctoral researcher who is now at the Jet Propulsion Laboratory at the California Institute of Technology, was the lead author of the study. Under current climate conditions, the model predicts a design for a soybean crop with 8.5 percent more productivity, but using 13 percent less water, and reflecting 34 percent more radiation back into space, by breeding for slightly different leaf distribution, angles and reflectivity. This work appears in the journal Global Change Biology. "The model lets you look at one of those goals individually or all of them simultaneously," said Praveen Kumar, a co-author of the study who is the Lovell Professor of Civil and Environmental Engineering at Illinois. "There might be some areas where you look at only one aspect - if you're in an arid zone, you can structure things to maximize the water efficiency. In other areas you may want to concentrate on food productivity." Plants have evolved to outcompete other plants - for example, shading out other plants or using water and nutrients liberally to the detriment of neighboring plants. However, in an agricultural setting, the plants don't need such competitive measures. "Our crop plants reflect many millions of years of evolution in the wild under these competitive conditions," said U. of I. plant biology professor Stephen P. Long, also a co-author on the study. "In a crop field we want plants to share resources and conserve water and nutrients, so we have been looking at what leaf arrangements would best do this." The researchers aimed for three specific areas of improvement. First, productivity. Second, water usage. Third, combating climate change by reflecting more sunlight off the leaves. To address all three, they used the unique tactic of computationally modeling the whole soybean plant. "Our approach used a technique called 'numerical optimization' to try out a very large number of combinations of structural traits to see which combination produced the best results with respect to each of our three goals," said lead author Darren Drewry, a former postdoctoral researcher who is now at the Jet Propulsion Laboratory at the California Institute of Technology. "And surprisingly, there are combinations of these traits that can improve each of these goals at the same time." The model looks at biological functions, such as photosynthesis and water use, as well as the physical environment. The researchers looked at how the plant's biology changed with varying structural traits such as leaf area distributions, how the leaves are arranged vertically on the stalk, and the angles of the leaves. For example, by changing the structure so that leaves are more evenly distributed, more light can penetrate through the canopy. This lets photosynthesis happen on multiple levels, instead of being limited to the top, thus increasing the plant's bean-producing power. A less dense canopy uses less water without affecting productivity. And changing the angle of the leaves can let the plant reflect back more solar radiation to offset climate change. "Most of the genetic approaches have looked at very specific traits," Kumar said. "They haven't looked at restructuring the whole canopy. We have a very unique modeling capability where we can model the entire plant canopy in a lot of detail. We can also model what these plant canopies can do in a future climate, so that it will still be valid 40 or 50 years down the line." Once the computer predicts an optimal plant structure, then the crop can be selected or bred from the diverse forms of soybeans that are already available - without the regulation and costs associated with genetic engineering. "This kind of numerical approach - using realistic models of plant canopies - can provide a method for trying many more trait combinations than are possible through field breeding," Drewry said. "This approach then can help guide field programs by pointing to plants with particular combinations of traits, already tested in the computer, which may have the biggest payoff in the field." The researchers hope their modeling approach will not only improve soybean yields, but also benefit agriculture worldwide as the population continues to rise. According to Long, "The Food and Agriculture Organization of the United Nations predict that by 2050 we will need 70 percent more primary foodstuffs to feed the world than we are producing today - and yet will have to do that with probably no more water while at the same time dealing with climate change." "We need new innovations to achieve the yield jump," Long said. "We've shown that by altering leaf arrangement we could have a yield increase, without using more water and also providing an offset to global warming." Next, the researchers plan to use their model to analyze other crops for their structural traits. As part of a project supported by the Bill and Melinda Gates Foundation, Long is leading an international effort to improve rice, soybean and cassava guided by similar computational approaches, with the end goal of making more productive and sustainable crops. "By examining plants using detailed computer models and optimization, we have the potential to greatly expedite the development of new types of agricultural plants that can tackle some of the greatest challenges facing society today, related to the need to produce more food in a more variable and uncertain climate system," Drewry said. Kumar also is affiliated with the department of atmospheric sciences. 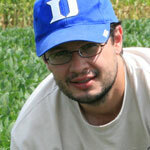 Long also is a professor of crop sciences and a faculty member in the Institute for Genomic Biology. The National Science Foundation and the Gates foundation supported this work. To reach Praveen Kumar, call 217-333-4688; email kumar1@illinois.edu. To reach Stephen P. Long, email slong@illinois.edu. The paper, “Simultaneous Improvement in Productivity, Water Use and Albedo Through Crop Structural Modification,” is available online.